It is absolutely no secret I'm a huge fan of theme parks, especially the Disneyland Resort. I'm also a huge fan of the food available at Disneyland as well as Disney's California Adventure. Recently, my wife and I stumbled across one of the quick dining options as a method of avoiding the foot traffic of the parade while getting a little sound shelter for our son. We came across Boardwalk Pizza & Pasta. Immediately, my wife honed in on their Cheese Ravioli offerings. We ended up buying one, then two... then for our next visit, two more. Loving the dish that much, I felt compelled to replicate it at home. Noted, the restaurant offers the ravioli with the options of tomatoes, pine nuts, and grated Parmesan cheese. I ended up leaving out the tomatoes and the cheese. First, I started heating the Balsamic Vinegar to create the Balsamic Glaze. I eyeballed the amount of vinegar and added about a tablespoon and a half of brown sugar and a teaspoon of white sugar. I brought that to a boil. I got two bowls out. One as a cooling and drying bowl for the ravioli and one for mixing in the pesto. Once the ravioli was ready, I put them into the first bowl. However, it didn't actually dry out all the way so when I started tossing them with the pesto, the everything got a bit too watery. I ended up drying out the first bowl and adding more pesto to give a proper coating of the ravioli. Since this was my first attempt at this, I didn't take off the glaze off the heat in time and it started to turn into molasses. I added some hot water, stirring and nurturing the glaze back to life. 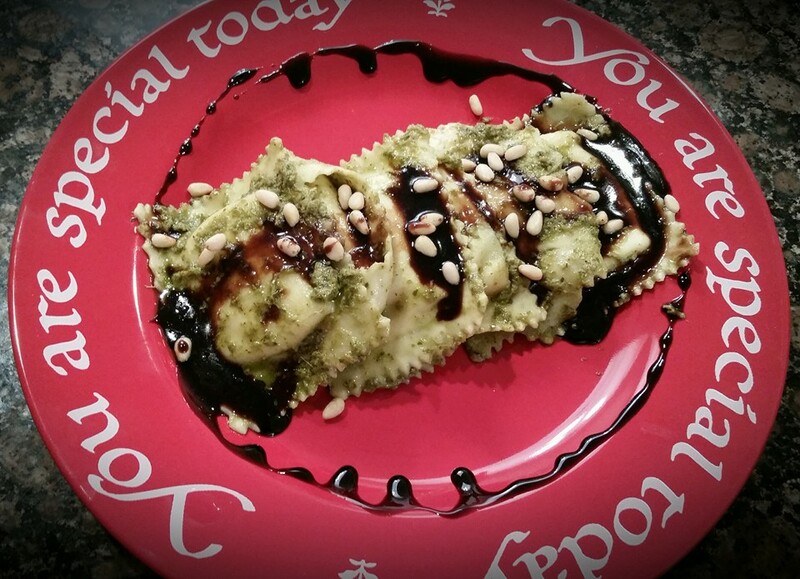 I then plated the ravioli in a line and sprinkled some toasted pine nuts. Returning back to the glaze, it took quite a bit of effort to bring the glaze back to life. BUT! It did finally happen. After which, I took a generous tablespoonful and circled my dish after dowsing the centerline of the ravioli. My wife and I were quite impressed by the result. It was basically a perfect replica of the park food. The glaze was a bit heavier and sweeter because I didn't tend to it with as much care as I should have. Nevertheless, it was very tasty. I think next time, other than giving the glaze plenty of love, I'll add on the grated Parmesan just to give it a bit more cheesiness to enjoy. Well, that's it! A very fun experiment; an exercise of art and science. Really thank you for sharing. Information your share is useful to me!